Even vampires are afraid of ghosts. After the death of my husband - and my dreams of motherhood - i returned to the family estate in Broken Heart, Oklahoma. Little did I know I would literally give up my life as Elizabeth Bretton, the Silverstone heiress. The whole undead situation calls for a drink - blood martini, straight up, please. If you haven't read the Broken Heart series, I highly recommend checking it out. 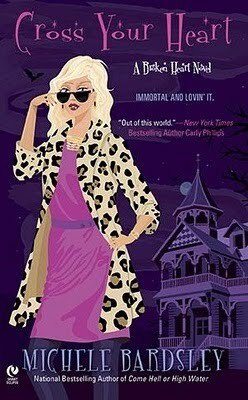 Michele Bardsley creates a paranormal world full of humor, great characters, and interesting plots. I was so excited for Cross Your Heart, and it definitely lived up to my expectations. This is book seven in the series, and like all the others, it absolutely didn't disappoint! Each book in this series has managed to pull me into the story from page one. In this book we meet Elizabeth Bretton, a very prim and proper vampire who ends up with a ghost after her. Then we meet Tez, a hunky, flirty were-jaguar - pretty much the complete opposite of Elizabeth. The banter between the two of them is hot, as well as funny! Then again, Bardsley always gives her readers great, steamy scenes as well as plenty of some good laughs! Together Elizabeth and Tez, along with the other residents of Broken Heart that we've met in previous books, try to solve the problem of the ghost and the mystery that goes with it. Something is causing strange behavior and fighting within many of the loving couples in Broken Heart. Is it the ghost, or something more sinister? In case you couldn't tell, I love this series, and loved this book. I'm already looking forward to the next one! :) Definitely a fun read. I give it 4 slices!